Salsas tend to brighten up during the summer with vivid colors and fresh flavors. 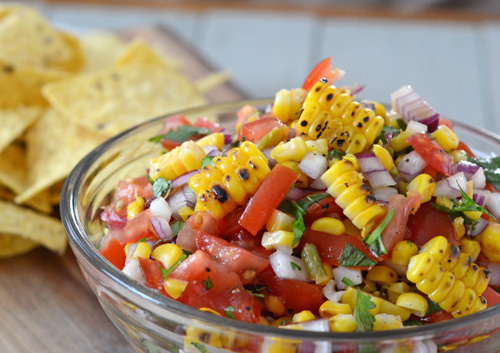 Plain ole "stick a corn nacho chip in me" tomato salsa takes a back seat to seasonal fruit and vegetable salsas. A colorful bounty like this salsa I made not only tastes good, it's good for you. Stoneware by Stony Claystation, Lenior City, TN. In general, eating a brightly colored diet is more healthy for you, as noted in the article Color Me Healthy - Eating For A Rainbow of Benefits in Today's Dietitian. Of course, it is relative because eating a pound of Skittles doesn't count, I don't care how colorful they are. 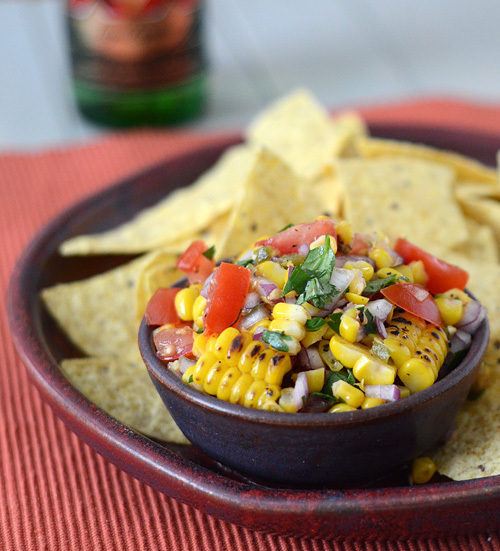 I used the beer braising method for the corn part of this salsa. Once the grill is preheated place a 8 x 8 stoneware or foil pan in the grill and add the beer, butter, and seasonings. 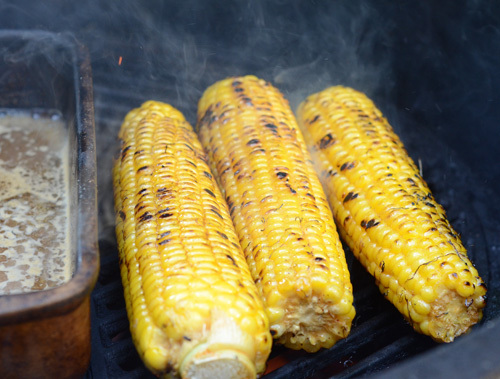 Place the corn on the grill grates and cook for 10 minutes, turning frequently (about every 2 minutes) for even charring. Each time you turn an ear, roll it in the baste pan and return it to the grill. Put the corn in the pan, carefully remove from grill and seal tightly with foil. Return the pan to the grill for 5 minutes. Remove and let rest, covered, for 15 minutes. Remove the corn from the cob and put in a large bowl. 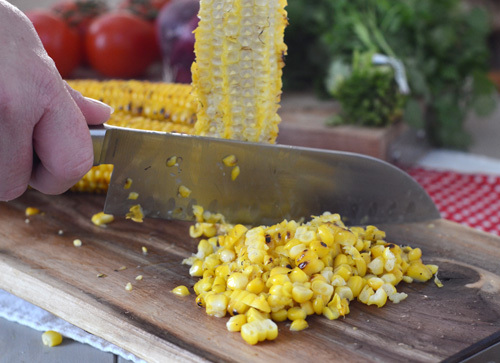 To remove the corn from the cob, hold the cob upright securely with a holder and run a sharp knife down each side. Add the remaining ingredients and toss to coat. It doesn't require a long prep time like some recipes that require brining the corn. It produces a reliable result. Lightly charring corn gives it a sweeter flavor but overdone grilled corn is dry and bitter. That's all on the cook. 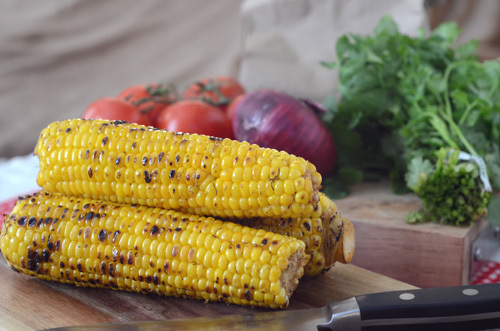 This method is more forgiving for the novice griller because it lets you get the char and then finish cooking the corn with braising, so it's less likely to burn or dry out. It is flavor flexible. This time these were going in salsa for tacos so I used a Mexican beer and a Southwestern seasoning. Last time it was BBQ so I used a light beer and BBQ rub for the seasoning. The basic premise is simple. Preheat your charcoal grill to 400f. Place a pan (see third step about size) with 12 oz beer, 1/4 cup of butter, and 1-2 tsp of seasoning on the grill. Grill the corn direct for about 10 minutes, rotating them every 2 minutes or so. Each time you turn them, roll them in the butter mixture before going back on direct heat. 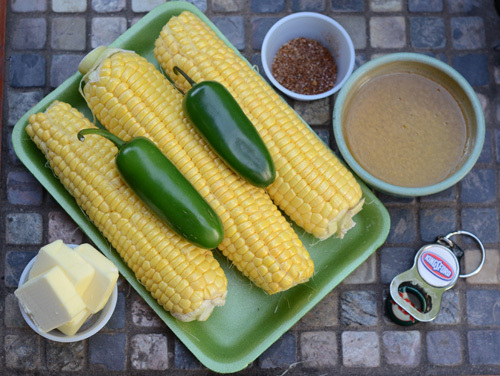 This layers on the flavor while keeping the corn moist. Pan size: You want a pan just big enough to hold the corn. A brownie pan is just about perfect for 4-5 ears. If your pan is too big, the liquid will evaporate more quickly. Ideally you want about 1/2 inch deep of liquid at the beginning. 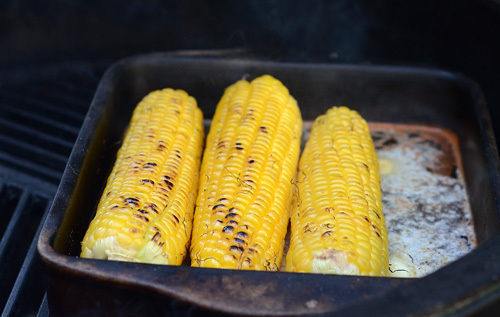 If you are doing a ton of corn you could use a steam pan if you have the room on your grills. Stoneware is ideal. After 10 minutes, put all of the corn in the pan, seal tightly with foil (BE CAREFUL - HOT) and cook for a few more minutes. Then remove and let it rest sealed in foil. This will lightly braise it and keep it all warm for 30 minutes or so while you finish grilling dinner. 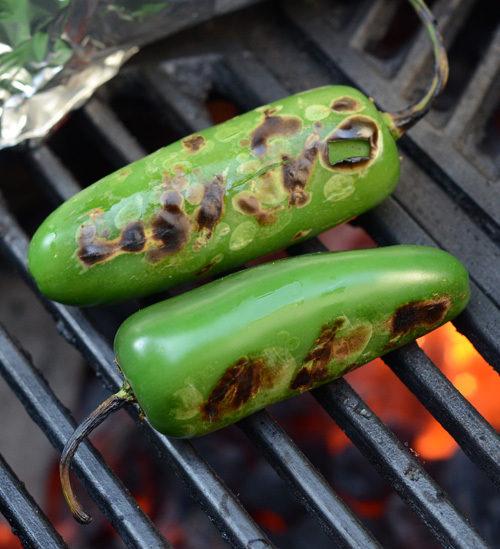 While the corn finished, I threw on some jalapenos to roast. Love that smell! Red, purple, green, and yellow - lots of pretty phytochemicals! You can buy a tool to strip the corn but a sharp knife makes quick work of it. Do you liven up your salsas during the warmer months? My favorite is obviously corn (sometimes black beans and corn), what are your favorites?